Aeronautics and astronautics are celebrating their anniversaries at MIT (Massachusetts Institute of Technology). It was 100 years ago that the first postgraduate program in aeronautics was created at the center and, as well, it is 75 years since the department was set up. 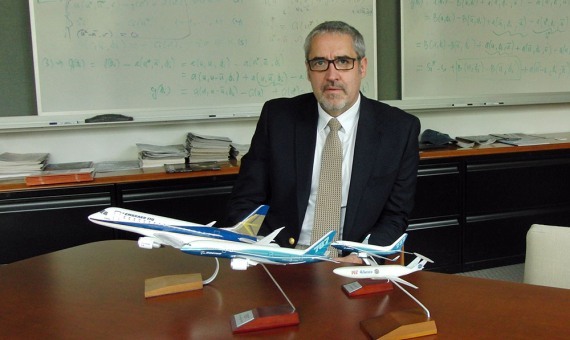 On the occasion of this double anniversary, we will learn the future of this discipline from the hand of the director of the department of Aeronautics and Astronautics (AeroAstro) of MIT, Jaume Peraire. His office is filled with miniature planes representing the past, present and future of aviation. In the corner is a framed museum piece, the American flag worn by astronaut David Scott, commander of Apollo 15, on a mission to the Moon. Peraire expounds the potential of his department with some slides that were presented months ago, right here, to the magnate Carlos Slim. What was the interest of Carlos Slim? Carlos Slim, Miguel Aleman Velasco and Miguel Azcarraga -owner of Univision- visited us last year because they were interested in satellite communication technologies that are capable of providing greater bandwidth. If the bandwidth is multiplied by ten, better service can be offered to the viewer. For example, using an iPad you could choose the camera you want to be projected on your TV and become, well, a director. How does the technological part work? By being able to miniaturize satellites, the cost is lower and it is feasible to launch some 15 to 20 mini-satellites into space. They are arranged as a constellation to provide better and wider coverage to certain areas of the planet. Until now, these satellites have not been sufficiently autonomous and capable, but things are changing. Presently, this system is reproduced with one or two large satellites, which often have to be placed in a higher orbit to have greater coverage. Communication, aircraft, satellites… it seems that the future possibilities are enormous. What is the health of AeroAstro at the moment? Its health and prospects are better than ever. The moment is unique. There are several technologies and applications that will have everyone talking. Where it is going to grow more economically is in air transport and autonomous systems and, to a lesser degree, in the commercialization of space nearest to the earth. Companies like Space X, Blue Origin or Virgin Galactic will democratize access to space. Does commercializing space mean that parcels will be bought out there? No (laughs)… In space you cannot stay still. What we have are orbits with more traffic than others because they give coverage to more people. Commercialize means that companies or government agencies send up satellites for commercial interests. Companies like Google, for example, may be interested in having access to their own satellites to photograph, extract information, movements of people, surveillance or investigation. That information can be sold. In the next 25 or 30 years, the world’s demand for air transport is going to double or even triple. And in air transport, what is going to happen? In the next 25 or 30 years, the world’s demand for air transport is going to double or even triple. The technological challenge is to meet this demand so that the environmental impacts and energy costs are minimized. This is achieved with new aircraft designs, propulsion systems, materials and fuels and also by a better understanding of the environmental impact of emissions in the atmosphere. The effect of combustion-derived particles is different depending on whether they are emitted at a height of 10 km or in certain areas of the planet. We know that emissions at this height and in tropical areas of the Pacific have a significant impact on air quality in many areas of the United States. It is due to air currents and because the chemical processes that affect the particles before reaching the Earth’s surface depend on weather conditions and the composition of the atmosphere. In addition, it will break the duopoly between Airbus and Boeing in the market for the larger transport aircraft. China, Japan, Brazil, Russia and India are making great efforts to enter this market. Some are going to get in. In Brazil, Embraer is already having great success with somewhat smaller 100 passenger aircraft. China is rapidly acquiring technology since Airbus has an assembly plant there. In 15 or 20 years, they will be able to compete with Boeing and Airbus because they have the resources, the capital and the will to do so. And what will the aircraft of the future be like? This is the N+3 [points to a model on the table] that could save up to 70% in fuel consumption. How? There are many technological innovations. The body of the plane is much wider -double bubble- and provides an aerodynamic lift so that the wings can be smaller. As well, the motors are in the rear and integrated with the fuselage. Airflow to the engine is much slower and to accelerate to achieve the required thrust is more energy efficient. By contrast, in current aircraft, the engine is not integrated with the fuselage and the energy consumption is higher. The third ingredient is materials that are much lighter and stronger: new alloys and composites. Petroleum fuels are suitable for aerospace and difficult to fully replace. Do we know when we will fly on a plane like the N+3? From a technological point of view, it would be possible in 15 or 20 years. We hope that NASA takes the step to build a prototype in the near future. There are still some technological problems to be solved, but in principle it does not seem insurmountable. In Brazil, cars run on alcohol produced from sugarcane. Investigations are also underway with organic materials such as algae, palm oil or even natural gas. Basically, with organic material which can be oxidized and has a high energy density. However, petroleum fuels are suitable for aerospace and difficult to fully replace. As for the autonomous systems, what are they and what will happen to them? This refers to driverless cars, planes without human beings on board or robots that can operate on an assembly line helping workers so that they are much more efficient. We will have no human presence on board aircraft taking off and landing at commercial airports – the problem is knowing when. Today, the technology exists to have a driverless car take you to the movies and then come and get you with a signal sent from your phone. The problem is that there is neither enough trust nor the legal framework for using autonomous vehicles routinely. Who would be responsible if there is an accident? Right now is there enough technology to fly aircraft without a human pilot? It is already done everyday. That is, in restricted spaces and not landing in Barajas (Madrid) or Logan (Boston). The technology is there. These aircraft are piloted. The only thing is that the pilot is on the ground. Now for every airplane that flies, we have one or two pilots on the ground. The challenge for the future is to know what to do in order to have 10 or 20 planes flying and only one or two pilots on the ground. This requires greater levels of autonomy. Of all the projects now under investigation in the department, which is the one that will have the greatest importance? In air transport, the N+3 and understanding the impact of emissions in the atmosphere. In autonomous systems it is artificial intelligence and machine learning or how to make robots and aircraft more capable, and in satellites, the propulsion for small satellites and optical communications. How do you explain that MIT is one of the most powerful global centers of technology? It is the culture of meritocracy in the extreme. A rigorous and highly competitive system with a set of people very passionate about what they do. We are privileged to be able to attract highly skilled people and we have a very important system of self-criticism. We are always trying to improve. The idea of ​​not falling behind and always wanting to go further is part of our DNA.